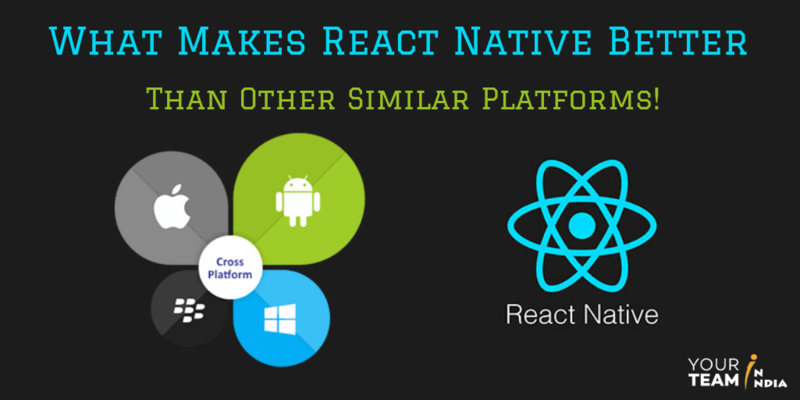 Since the launch, React Native has surprised every tech enthusiast in the mobile app industry. Because this programming language fulfilled the purpose of its development i.e to overcome the limitations imposed by the hybrid apps. Let’s take a look back at the rise of react native applications. It all started with deep regret of Mark Zuckerburg, the CEO of Facebook, in 2012, saying that “The biggest mistake we made as a company was betting too much on HTML5 as opposed to native”. As promised, the company introduced the react native framework in 2015. During the initial release, companies were only able to develop applications for the iOS platform. But gradually, the company extended the support of react native applications for Android as well. One more report justifies the above statement. According to a survey by MarketsandMarkets, Cross-Platform development is rapidly increasing & estimated to generate $80.45 Billion in the year 2020. It simply depicts that the cross-platform approach is becoming the first choice of developers & startups for mobile app development. So, before moving ahead, it’s important to understand why cross-platform development is becoming popular. The difficulty to develop the backend that will work for different operating systems brought forward the idea of hybrid apps. The alternative was to develop a separate code for different operating systems. But this alternative was a time consuming & expensive approach. Therefore, a large chunk of entrepreneurs started using hybrid apps. It is a cost-effective solution. You can use the re-usable code. The above advantages of cross-platform make it an ideal approach for mobile app development. However, it also leads to confusion. It’s because there are numerous platforms available that offer a seamless development process. What do you think a user might expect from a mobile app? The answer is an excellent, personalized experience & real-time information. To make your users satisfied, without adding a toll to your budget, you need a mobile application that is performance driven & cost effective. For the above reasons, react native developers & startups consider this programming language as their top choice. React Native Applications offers seamless user experience & performance like native apps. Furthermore, it is easy to learn & allows react programmers to release updates instantly without entering the app stores. In fact, it’s modular & intuitive interface makes it easy for the developers to transform web apps into mobile apps. For all the above reasons, it is also an ideal solution for the development of MVP. Without spending a lot of money, you can get your mobile app running within a short time span. Hence, it would be fair to say that react native apps are the future of hybrid apps. But a lot of entrepreneurs & mobile app developers might be looking for the comparisons like ‘Ionic vs React Native’, ‘react native vs xamarin’ or ‘react native vs phonegap’. Performance Native Experience Slow in comparison to React Native Performance is stable. Slower in comparison to others. Testing Real Mobile Devices or Emulator Required By using any browser you can test the code. Testing can be done using Mobile Apps. Testing can be done using browsers, mobile devices or emulators. Hardware Compatibility React Native itself is capable. Apache Cordova is used. SDK Kit is required. It doesn’t offer much control over hardware, therefore, apps might become slower with frequent render updates. Reusability The platform-specific code needs to be changed. Optimum Reusability of Code. It allows you to reuse 95% of the code. You can reuse existing native libraries. Indeed, React Native is better & unique than other similar platforms. It is an excellent framework that is easy to learn & offers a good performance as well as an interface which is comparable to native apps. Moreover, some technology enthusiasts consider that react native apps are the future of hybrid mobile apps. All in all, it’s a win-win game for the organizations that want to satisfy the customers with a tight budget. What else do you expect from a cost-efficient solution? Leave your thoughts in the comments section below! 7 Things Startups Should Know About Outsourcing!